Lo-back blue/black leather look seat covers set. Enhance the interior of your car whilst protecting your seats from wear & tear, kids, spills, etc. Can be easily wiped clean with a damp cloth. 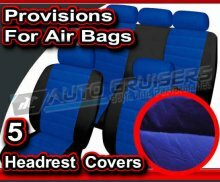 This Set comes with5 headrest covers, two part rear blue cover with black on both sides. Soft, supple quilted leather look, Provisions for airbags. Please note:No exact application or suitability guide is available for seat covers therefore we will not be able to confirm if they are suitable for your model (kindly do not email model details to check). We are not in a position to guarantee suitability but if not suitable we offer full refund under our 14 days return policy. These covers are suitable for most standard and average size seats but may not be suitable for sports style and large seats. There will be models where these may not be an ideal fit or suitable. Please try the covers carefully and pack them well if returning for refund. Since seats folds and lifts in different ways in every model, the seat covers do not come with fitting instructions. If not sure, your local garage or dealer may be able to advise and assist. Images for illustration purpose only. Colour of seat cover may vary due to flash and suchlike.